ShelterBox is a charity that delivers practical emergency aid to families who have lost everything because of natural disaster or conflict. We aim to provide safe shelter as quickly as possible, and the tools that will help communities to rebuild. Our global network of supporters, staff and volunteers make it possible to deliver aid to some of the most remote communities in the world. Most recently, we’ve been delivering tents, mosquito nets and water filters to Indonesia, in the wake of the devastating earthquake and tsunami at the beginning of October. Giving Tuesday is a moment of conscience and celebration that brings fundraisers together. ShelterBox is a very family-focused organisation, so we love the idea of becoming part of a global tribe of charities, all visibly working together on the same day. On Giving Tuesday we’ll be sharing the story of a Syrian father and his children. Their experience really shows the impact our aid can have on families who’ve lost the security and stability of home. Syria is one of our longest-running operations and the need there is only increasing. The income raised from this campaign will help us respond to crises in Syria and around the world, quickly and efficiently, putting us in good stead for 2019. For our Christmas appeal we’re hoping to raise £250k to support our disaster relief efforts around the world. It’s our most important planned campaign of the year, and to achieve this steep target we need as many ways to reach supporters – existing and new – as possible. Giving Tuesday falls in the middle of the campaign so it’s a great moment to share the story of one of the families we have helped. 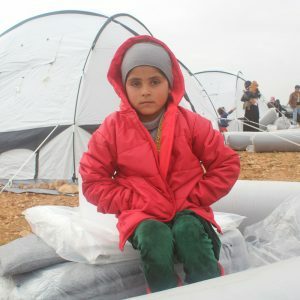 Being part of Giving Tuesday means that together we can spread the word about ShelterBox, highlight our work in Syria and encourage people to give a donation that can bring warmth, protection and hope to families worldwide. Click here to read more about the Shelterbox Christmas appeal. Donations to the National Gallery will be doubled on Giving Tuesday!